A tradesman let out a "horrific scream for help" as he was mauled by THREE DOGS during a prolonged attack on a rural property in Sydney's north-west on Friday morning, a witness says. 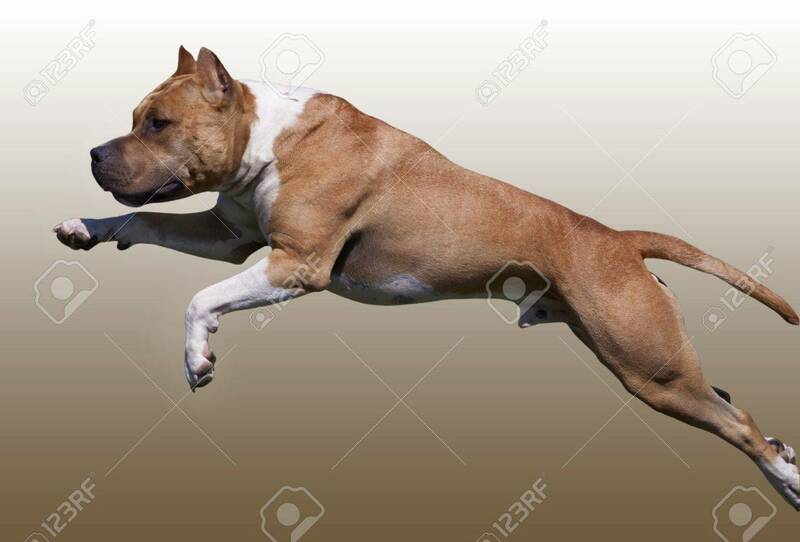 The 36-year-old man was taken to hospital with deep wounds over his body after the dogs, which Hills Shire Council said were AMERICAN STAFFORDSHIRE TERRIERS, tore into him at the property on Pitt Town Road in Kenthurst just before 8am. A witness, Robert Brooks, told 2GB how he heard "horrific screaming and yelling ... and [the victim's] just horrific scream for help", prompting him to run and look over the fence. "These dogs are just attacking him and he's just helpless, and we're helpless as well," Mr Brooks said. "The first reaction is to try to jump over and get [the dogs], but mate, there's no way. We're going to sort of get mauled ourselves. "It was just horrific mate. We couldn't help the poor guy, you know?" Mr Brooks said the man had been in the company of the property owner's daughter in a paddock when the pet dogs latched on to him. The woman also suffered minor injuries as she attempted to pull the dogs off the man. The attack was prolonged, Mr Brooks said, and neighbours initially could do nothing to help. The man eventually escaped from the animals and was helped over the front fence by neighbours, including an off-duty nurse, who performed first aid before police, NSW Ambulance paramedics and the CareFlight helicopter arrived. Mr Brooks said the man was conscious following the attack, but suffered "big puncture wounds" to his arms, back, thigh and calf. "There was blood but there wasn't actually blood gushing out, it was actually torn down to his muscles," Mr Brooks said. A CareFlight spokeswoman said the tradesman was believed to be at the house carrying out some work when he was attacked. "The patient received bites all over his body," she said. 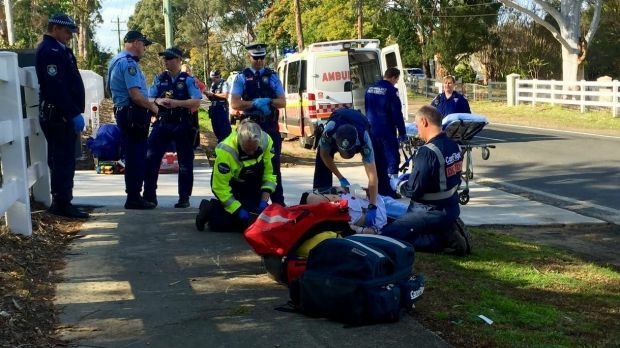 A NSW Ambulance spokesman said the man was treated for cuts to his legs and his body, and was taken to Westmead Hospital by road ambulance in a stable condition. Mr Brooks said one of the dogs was caught immediately after the attack, and police and council workers were at the scene searching for the other two dogs. A council spokeswoman said: "One of the dogs is subject to a previous nuisance order to prevent it from wandering; however this attack occurred on the property." Who cares if the dog's are on their property? That means everyone that steps foot on the property is fair game! 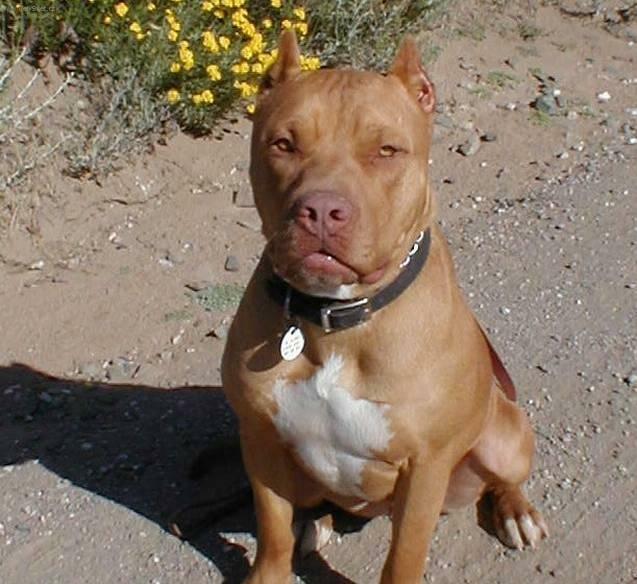 How about we stop the insanity, let pit bulls go extinct, and go on with normal human/canine behavior? Remember that anyone? It's when dogs don't go around killing and attacking for no reason. NO REASON! There's no abuse, no neglect, no taunting, no provocation of the pit bulls, yet they're murderous animals. 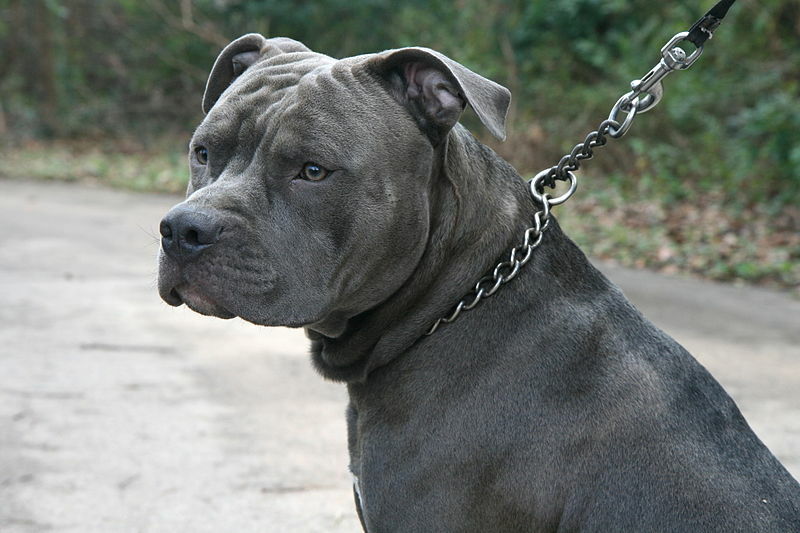 3 pit bulls attacking someone is akin to attempted murder.